12.5" RCOS @ ~ f/9 (2880 mm fl) at 0.64 arcsec/pixel. Shown at 1.28 and 3.11 arcsec/pixel. SBIG STL-11000 w/ FW8 filter wheel & AstroDon Gen-2 RGB filters. eXcalibrator v5.0 for (g:r) color balancing, using 189 stars from the APASS database. CCDStack to calibrate, data reject and combine the sub exposures, create the RGB image. PixInsight for gradient removal, non-linear stretching with HistogramTransformation. The north is to the right. 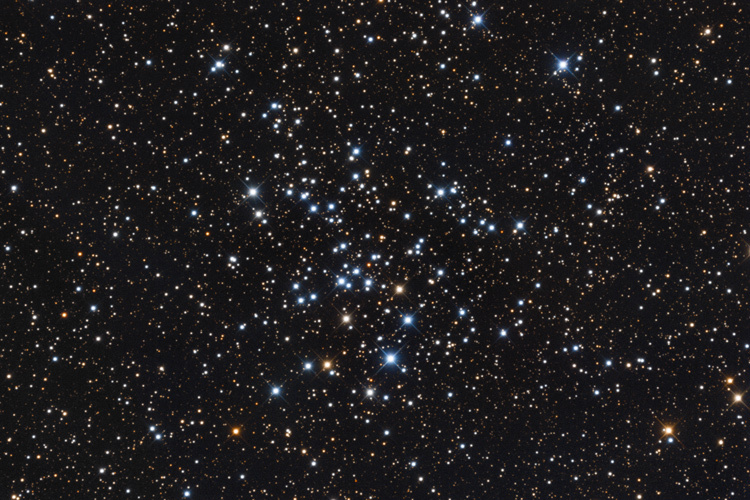 NGC 1528 is an open cluster in the constellation Perseus. William Herschel discovered the cluster in 1790. It has about 165 stars and is 1500 to 2500 light years away. NGC 1528 as an estimated age of 270 to 370 million years.